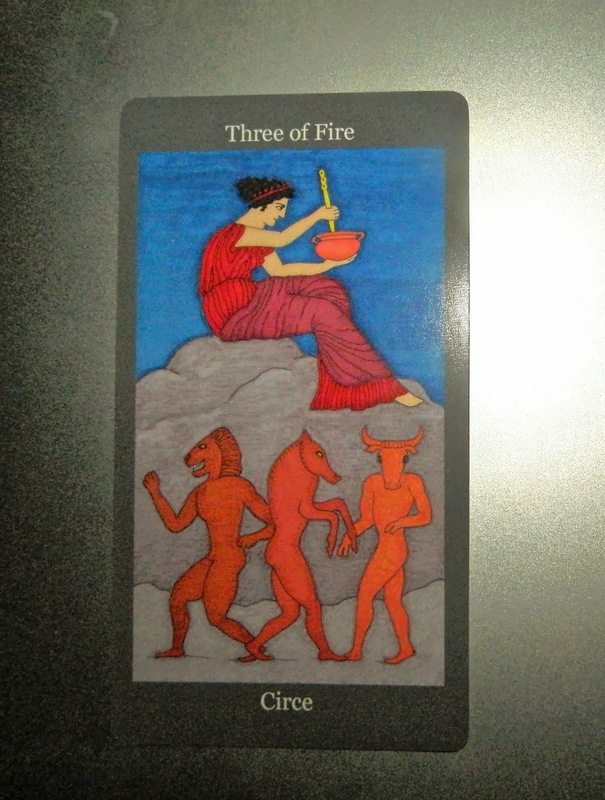 Today's Draw: Three of Fire, Circe from the Dark Goddess Tarot by Ellen Lorenzi-Prince. Are you impeccable with your words and thoughts? Might they be creating something unsavory in your life? Does your cabeza need a makeover? Today I asked this deck to give me more information on the spiritual maturity thing we've been talking about for the past couple of days. In a nutshell, we've explored love as the answer to every problem and we've discussed the difficulty of holding true to a belief in love/acceptance/forgiveness, even when that is hard to do. Today, Circe comes to us to say, "ideas have a life of their own." Circe is the Greek goddess of magic and she knows the importance of being impeccable, not just in action, but in thought and intention. As we learn to re-think the way we consider others, treating even those we might consider unsavory with love and compassion, it's possible our actions and intentions may change before our thoughts do. For example, we may choose to stop certain behaviors, like speaking ill of others, long before we learn to stop *thinking* ill of others. The intention behind stopping speaking in this way may be more self focused—personal growth, reducing karma, eliminating drama—than being focused on opening our hearts or creating healing in others. But stopping the action is a critical first step to stopping the overall energy of judgment/ill will/negativity in our lives. Personally, this has been my path so far as I've tried to love both me and others by reducing the drama, judgment, victimization, separation and other things in my life that keep universal light and love at arm's length. Quitting the behavior or action is a hard. There are times I see stuff going on around me and want to speak my mind, but don't. Then there are times I still dip a toe in. But the "wanting" is still there in my head...the curiosity. If I'm entirely honest with myself, probably the hardest thing for me is to release the vestiges of a victim mentality. In a victim mentality, you're not just an innocent who is poorly put upon by others for no reason, you're creating a separation between yourself and others. "I'm innocent and the other is evil. I am not like the other." But if, like me, you believe people come into your life for a reason, then there's something there for you to learn...a mirror somewhere for you to see yourself in. And if the same thing keeps happening over and over again, then you're not learning. And because the mirror is part of the love—seeing yourself in others is crucial to the idea of oneness—then you're also not loving. You're in denial. And you're not moving forward. These ideas we have in our head—that we are innocent victims, that others are broken and we are whole, that hate is a solution—have a life of their own. And the thoughts we have, regardless of our actions—thoughts of dislike while exhibiting like, thoughts of curiosity while avoiding drama—have a life of their own, too. In fact, our ideas and thoughts and intentions shape our reality even more than our actions, do imo. Our actions tend to shape others' views of us, while our thoughts shape the way we see others and the world. And if you believe that thoughts can make things real in the way The Secret outlined, then if your thoughts don't follow your actions, you're on a slippery slope. "Be impeccable with your word" is one of The Four Agreements outlined by Don Miguel Ruiz. But it's not just the words that come out of your mouth. It's making the words that come out of your mouth and the words that float in your head match. 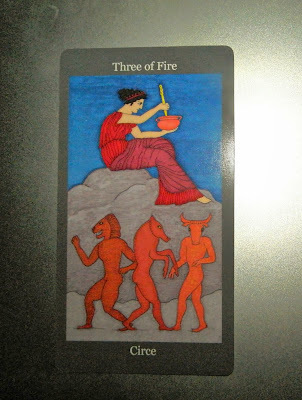 Circe comes to us today to remind us that, until we feel peace with a situation down to our last cell, we continue to create that situation to some degree in our lives. The situation doesn't happen to us by mistake. We create it by giving life to the idea of it in our heads. So how do we get it out of our heads? Have you not been listening to this week's lessons? :D We get it out of our heads by breaking the habit of the fear/hate/negativity and replacing the thought with love. I'm nowhere NEAR achieving that myself...haha. But because I've made some meager inroads on this in my life, I'm relatively certain that when all you think, do and intend is love, then love is your reality. And it doesn't matter if others see ill in your intentions, because you won't take it personally, (another of the Four Agreements) you'll see it with compassion and love. So your thoughts and ideas not only have a life of their own, they drive your reality. And that's the magic Circe commands. So take a look at what is manifesting in your life. Do your thoughts and ideas need a makeover?